Like most chefs, Sean Sherman practically lives in the kitchen. But in his spare time, this member of the Oglala Lakota tribe has been on a quest to identify the foods his ancestors ate on the Great Plains before European settlers appeared on the scene. After years of researching and experimenting with “pre-colonization” foods, he’s preparing to open a restaurant in the Twin Cities this winter that showcases those foods, reborn for contemporary palates. Sherman, who calls himself the Sioux Chef, grew up on the Pine Ridge Indian Reservation in South Dakota. It’s where he first started to learn about the traditional foods of the Plains, whether it was hunting animals like pronghorn antelope and grouse,or picking chokecherries for wojapi, a berry soup. Sherman’s grandfather was among the first Native American children to go to mission schools on the reservation, and he was one of Sherman’s first teachers. Forced assimilation during the 19th and early 20th century wiped out much of Native American food culture across the country. When his grandfather died when Sherman was 18, he was left with many unanswered questions. In the meantime, Sherman worked his way up in the restaurant world, eventually becoming an executive chef at Minneapolis’ La Bodega in 2000. Around the same time, he had the idea to write a Lakota cookbook. Although there were some Native American cookbooks already on the market, he says he found that most of them focused on the Southwest or made too many generalizations about food across regions and tribes. He learned more from oral histories and also started reading historical first-contact accounts written by Europeans, although they weren’t always helpful. “A lot of those first-contact reports focused on what the men were doing [hunting], not on what the women were doing — processing all of the food,” he says. One of his breakthroughs came when he lived in Mexico for a while. He discovered that the traditional methods of drying and grinding food in that region were similar to those his tribe had once used, and indigenous people all across North America were working with ingredients like corn, beans and squash. Back in Minnesota, he continued to try and piece together a picture of the traditional diet of the local Dakota and Ojibwe tribes. He also spent a lot of time traveling across the state, adding more staples to his growing list, including bison, venison, rabbit, river and lake fish, trout, duck, quail, maple sugar, sage, sumac, plums, timpsula or wild turnip, wild rice, purslane, amaranth, maize, and various wildflowers. Identifying the ingredients has only been half of the challenge, however. He’s also had to figure out how to preserve everything. He’s relied mostly on a food dehydrator (for efficiency), but he’s also experimented with drying by sun and wood fire. Some chefs have tried similar concepts in other regions. Nephi Craig brings Apache and Navajo influences to the food he prepares at the Sunrise Park Resort Hotel in Arizona. The Misitam Cafe in the Smithsonian National Museum of the American Indian in Washington, D.C., has won national acclaim. Sherman says his restaurant will feature a seasonal menu with family-style dishes, like wild rice flatbread, cedar-braised bison, smoked turkey wasna, seared walleye with sumac and maple sugar and balsam fir iced tea. Most of his ingredients will be sourced from local farms. Some farms, like Wozupi, work with local tribes to grow indigenous plants and preserve heirloom seeds. Sherman says his goal is to bring a sophisticated touch to traditional ingredients, and he hopes it will be a way to share old traditions with new diners. “We need this kind of restaurant all over the place,” he says. But other groups on reservations are interested in reviving pre-colonization foods to reincorporate them into local diets. The Traditional Western Apache Diet Project and the Crow Creek Fresh Food Initiative are offshoots of a food sovereignty movement that is picking up steam on several reservations around the country. A recent study by the U.S. Department of Agriculture also found that several indigenous foods that aren’t widely consumed anymore are highly nutritious. If his restaurant is successful, Sherman hopes he can expand the concept and create similar ones across the country, training young Native American chefs in keeping their tribes’ best culinary traditions alive. 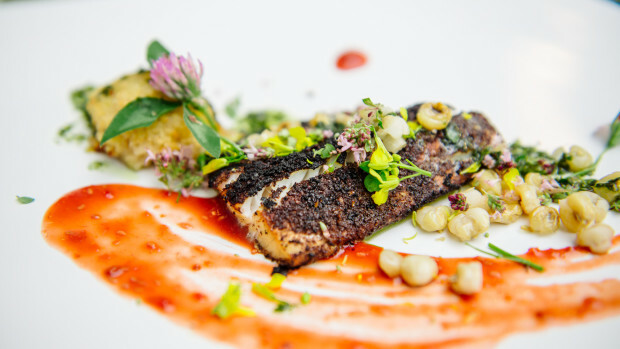 This entry was posted in Arts & Entertainment, Top Story and tagged Native American, Native American chefs, Restaurant, Sean Sherman, Sioux Chef by Kim Kalliber. Bookmark the permalink.